I am the mother of one 18 year old son. He just graduated from highschool,and is seeking to study Law Enforcement. In the past years I have been a nanny to three children, tutored elementary age children in Basic Literacy skills, and worked grass roots efforts in low income neighborhoods to end Childhood obesity. I enjoy making arts and crafts with children,and teaching them to be diverse, empowered and creative. 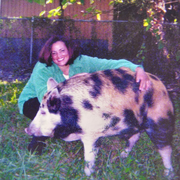 I enjoy animals,as I operate a natural pet treat business on the weekends at festivals and farmers markets. I have 6 fur babies,3 cats and 3 dogs.I consider myself responsible,nurturing and dedicated to inspiring, loving,educating and caring for children. Robyn doesn't have any reviews yet.